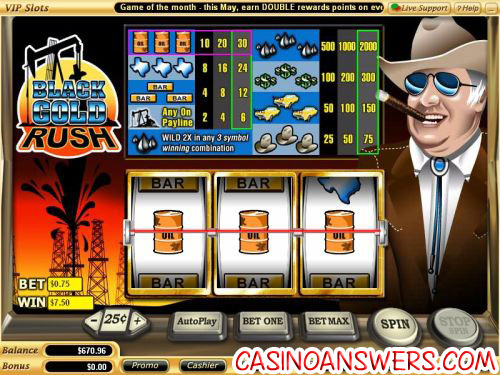 Black Gold Rush Classic Slot Guide & Review - Casino Answers! Black Gold Rush is a 3-reel, 1-line classic slot machine developed by Vegas Technology, featuring a wild symbol with a multiplier. You can play the Black Gold Rush classic slot at US-friendly online casinos VIP Slots Casino and Caribbean Gold Casino. To play the Black Gold Rush slot, you can either play with the default $0.25 coin value, move it down to $0.10 or raise it to $0.50, $1, $5 or $10. Then, you can either play one, two or three coins. Casino Answers recommends the 3-coin maximum bet, due to increased value on the top jackpot. The minimum bet on the Black Gold Rush slot machine is $0.10 and the maximum bet is $30 per spin. Black Gold Rush is great for casual players. Once you’re ready to play, use the “Spin” button or “Bet Max” to play the maximum 3-coin bet. There is a skill stop feature that can be used during any spin. The “Stop Spin” button can be found to right of the “Spin” button. The top jackpot on the Black Gold Rush slot game is the Drops of Oil symbol. 3 Oil Drop symbols on a 3-coin bet will win you 2000 coins! This symbol is also the wild symbol. Not only will it complete a winning combination, but it will also double it. Play at this years #1 online casino for United States - Slots.LV.Symbols on the Black Gold Rush classic slot machine game are as follows (1/2/3 coin payouts in parenthesis): 1 Drilling Rig symbols (2/4/6), 3 Gold Bar symbols (4/8/12), 3 State of Texas symbols (8/16/24), 3 Oil Drums (10/20/30), 3 Oil Baron’s Hat symbols (25/50/75), 3 Cadillac symbols (50/100/150), 3 Dollar Sign symbols (100/200/300) and 3 Drops of Oil symbols (500/1000/2000). There are eight winning combinations in Black Gold Rush. Black Gold Rush has an autoplay mode that can be accessed by hitting the “Autoplay” button in the game buttons. You can set the number of spins (up to 500), number of seconds between spins (1, 1.50 or 2), to stop once all spins are complete, to stop when the jackpot is won, to stop if a win exceeds or equals ($50, $100, $150, $200 or $250), to stop on any win and to stop if your credits are increased/decreased by ($50, $100, $150, $200 or $250). You can cancel autoplay at any time. To get a 100% signup bonus up to $777 (over three deposits) to use on the Black Gold Rush slot machine and many more casino games, sign up and make your first deposit today at VIP Slots Casino! Are players located in the United States able to play the Black Gold Rush slot for real money? Yes, US players can play the Black Gold Rush classic slot game at any Vegas Tech online casino, including two of our favourites VIP Slots Casino and Caribbean Gold Casino. What casinos have the black gold rush slot machine game?